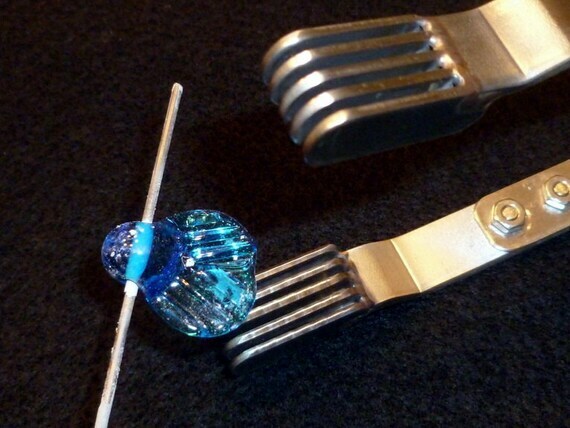 Home » Blog » #lampwork classes » Happy December & New Beads…. Happy December & New Beads…. Two Weeks & one day…. It's Julie T. from Sparks, NV!! I am so excited that I won your tree bead! It is gorgeous and I can't wait to figure out how I want to "display" it. This great news is just what I needed during this difficult time. Thank you for your kindness and for sharing your little works of art with us! Have a wonderful holiday season! All the beads are beautiful! That encased flower pot bead is fantastic. My handmade gifts this years will be brooches/pins, and hair accessories. In addition, I will be doing some baking. Hi Jelveh, Superb bead this week…reminds of a ginger jar…love it! You have been busy, girl! Wow! Great work. I have been making glass Christmas trees on copper wire and drilling holes in tree bark so they look like they are growing there…great for those people that don't wear jewelry…and for those grandkids that want something Grandma made. Oh my goodness Jelveh-you have completely outdone yourself! I love this lil flower pot bead-so pretty!!!!! Going over to etsy to checkout all your beadie goodies!! This is a fantastic Bead. Merry Christmas. Jelveh dear, you are so creative! BEAUTIFUL piece, it does look like a ginger pot! I've done individualized pieces/sets for sisters, baskets filled with homemade yummies for the neighbors that Mother and I have worked on as the fruits and veggies came in this summer. Just finished the last of the "For Sale" holiday pieces, thank goodness. Now it's time to get ready for the holidays in this cold midwest. Happy Holidays to you and your family. I am working on crocheting some lace snowflakes as part of my handmade offering this year. Merry Christmas!